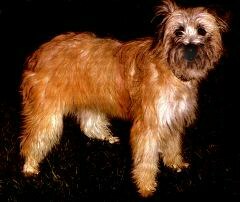 I am sometimes called a Pyrenean Shepherd because my relatives have lived and worked as sheep dogs in the French Pyrenees mountains for more than 2000 years. Some of my cousins have smooth coats and others have shaggy coats. Still others have something in between those two, like mine. Beyond that, we are all devoted and intelligent dogs. I might not be too keen on strangers, but I really do like my own family. When fully grown, I am between 15 and 22 inches tall (38.1 to 55.9 centimeters) and I weigh between 18 and 32 pounds (8.1 to 14.4 kilograms). We have no Berger Des Pyrenees Breeders listed at this time. Click here to place your Berger Des Pyrenees Ad!